"Rogue Group, use your harpoons and tow lines around your legs. - Luke Skywalker Fast, agile and well-armed, the T-47 Airspeeders flying over the battlefield lift the spirits of rebel attacked soldiers. Providing the Alliance with valuable air support, T-47 Airspeeders should never be underestimated. 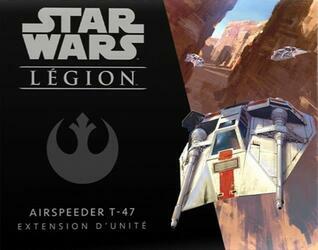 This STAR WARS: LEGION add-on contains 1 finely sculpted Airspeeder T-47 minifigure to build a heavy unit, as well as new Unity and Upgrade cards for deployment on the battlefield.